You won’t want to turn off the lights after watching this creepy video footage, which is being cited as proof that ghosts are haunting Deerpark C.B.S, a secondary school in Cork, Ireland, which was founded way back in 1828. Video evidence of paranormal activity at old Irish school? The footage, captured by the school’s surveillance system appears to shows lockers being rattled, doors being banged and a safety sign being mysteriously upended, all without any sign of human interference. School officials and paranormal experts are pointing towards another explanation — disembodied spirits (seemingly agitated as you can see from the video) who are haunting an educational facility that’s been around since before the Victorian age. According to headteacher Aaron Wolfe, unexplained happenings have been going on at the school for years, including an uncanny chill that seems to linger outside the religious room and peculiar noises that seem to emanate from one of the bathrooms. The school, as you can see for yourself (below), is quite real and has an excellent reputation. The haunting incident took place on October 1 at 3 a.m. in the morning. So far, school authorities who have examined the video have discounted the possibility that fishing lines or other human interventions might explain the footage. What do you think? Does that video show proof that ghosts exist? Let us know in the comments below! 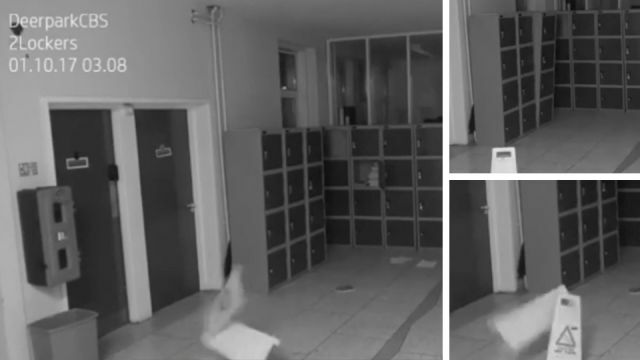 Hey Buddy!, I found this information for you: "Shocking Video Proof Of Ghosts Haunting School In Ireland". Here is the website link: https://www.thealternativedaily.com/shocking-video-proof-of-ghosts-haunting-school-in-ireland/. Thank you.